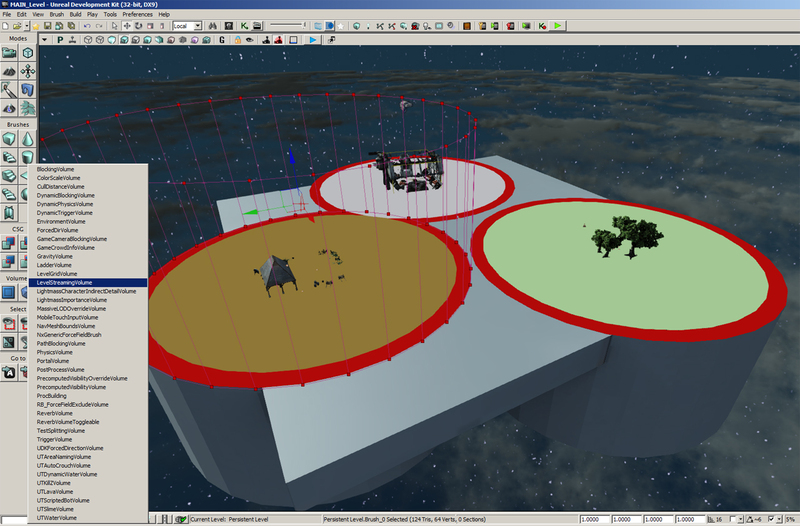 With no streaming capability in UDK's audio system, all sound referenced by actors and Kismet sequences in a level is loaded into RAM on level load, and will remain there until the level is unloaded. 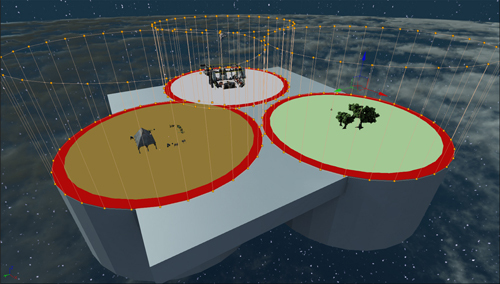 The same applies to all other placeable assets of course, and level designers will usually use Unreal's Level Streaming features to load/unload areas of a map as required, in order to reduce the load on memory and performance, and also reduce initial load times. It’s a good idea to manage audio in the same way. The benefit of placing audio assets and Kismet sequences in streamed audio-only levels is it gives you very tight rein on what sounds are loaded into memory at any one time - thereby helping you to stay within budget and not exceed your maximum number of channels. It also keeps audio separate from the rest of the game, which allows for greater control over your assets/implementation, and means that the files you need to work on are less likely to be locked. This tutorial will show you how to put your audio assets in designated audio levels, and control the loading and unloading of these assets using level streaming volumes. There are several ways to load and unload levels during gameplay (including Kismet based and ‘distance from viewer’) - I'm going to use Volume based streaming as it seems to be the most robust method, and it's simple to set up and make changes to as your project progresses. The image above shows a basic map containing 3 distinct areas, Farm (brown), Forest (green) and Industrial (grey). I’ve made a new level for each area and populated it with some simple ambient sounds. The three coloured circles show the maximum attenuation range for the sounds, and the 3 red bands show the perimeter of the streaming volumes associated with each of the levels. When the player touches a streaming volume, the level associated with it is streamed in so that by the time the placed sounds contained within it need to become audible, they are already present in memory. This obviously means that your player must enter the volume in a place where the loading/unloading of sounds is not audible - ie. the boundaries of the streaming volume must extend beyond the max attenuation radius of any placed sound actors. Level load times will depend on how much audio is referenced in the level; you'll need to experiment with this to make sure you've left enough time for the level to load before any of its audio is needed. (NB. 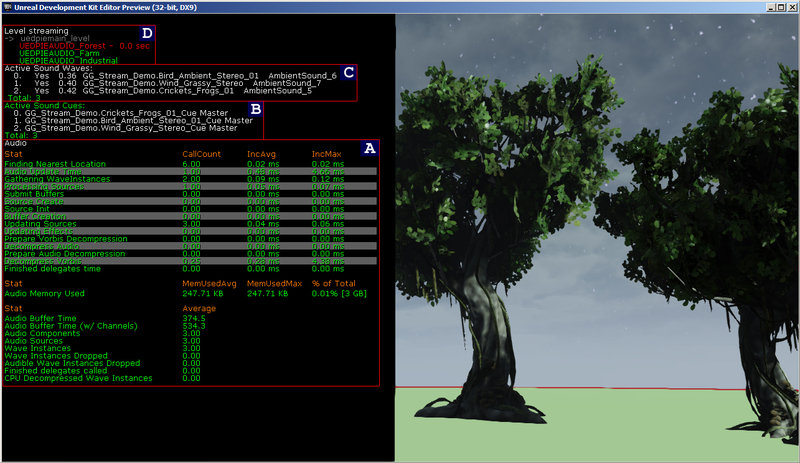 you should only monitor whilst running the game on your target platform - this demo is on PC). Shows the full path name of each active SoundCue (active means its soundwave data currently has an in-game volume > 0) and the SoundClass it belongs to. The time taken for the level to load is also displayed. I made a quick demo to illustrate load/unload between 3 areas in a map - here's a video. (I blacked out half the screen so the memory stats would show up better). Unreal audio memory management with Level Streaming from ggatheral on Vimeo. Any thoughts/questions/corrections please get in touch! I never thought of adding audio to its own level. Really good idea. Allows you much more control over the level. I've always had an issue with keeping audio specifically arranged in a large level so this cleared up a lot for me. I normally use the level streaming in Kismet also, I wasnt aware that the volumes provided less performance hit! Thanks for this. Keep them coming! Really interesting post! It's difficult to find a really good explanation of managing audio memory online. Thanks for posting! Hi Brad, no problem glad you found it useful. You had a pawn entering colored zones to turn on and off audio. Can audio values (perhaps via sliders) be used to turn on or increment the amount of visual content, like as you increase the volume of a 'wolf howl' instrument, you get more wolf eyes glowing in the trees of a dark forest ?